Looking to explore the Geopark with a group? 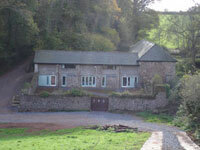 Then Warren Barn, run by Geopark partner Torbay Coast and Countryside Trust, could be for you! Set in a seculded valley, surrounded by woodland and meadows within Cockington Countrypark, the barn provides an ideal base from which to explore the whole of the Geopark. A range of exciting and inspirational activity packages led by a team of experienced education rangers is available. Of course, the centre also welcomes self led groups of all ages.